Mercure Hotel Art Leipzig. Book your hotel now! Free Wifi! For centuries, Leipzig has been the vibrant center of Saxony. The city still delights visitors with its lively atmosphere, magnificent architecture and cultural highlights like the Gewandhaus concert hall, German National Library and Thomaskirche church. Relax in comfort at the Mercure Hotel Art Leipzig, where you can choose between the extremely spacious Privilege Rooms or our Standard Rooms. A room is also available that has been specially adapted for guests with reduced mobility. Our hotel 72 non-smoking, air-conditioned rooms furnished to a high standard. We offer WIFI and DSL Internet access around the clock. One child aged up to 12 years may sleep free of charge in the parents' room. Your pet is welcome for a charge of EUR 10/night. When arriving, the older receptionist "teached us in the very German way" that it was not correct to book all three rooms on one name only, but all names should have been added. Well, I am not quite sure how easily that would have been possible in the booking system - my mistake. The other receptionist was extremely polity and she double checked the next morning that everything was fine during our stay - I suppose she noticed as well that her colleague was rude. All point to her for her kindness! The parking place is in a cellar parking hall with extremely tight way, we hardly got in with a pretty long Volvo S90, but to get out was even more difficult. I managed not to destroy the rent car, tough. Hotel fine, nice modern room with a safe, comfortable bed, good breakfast, pleasant staff who allowed me into my room early. Only issue was that the lift was out of action all weekend so we all had to walk. Using the stairs with luggage is quite inconvenient. You know that it will not be mended while you are there. Surely it should be possible to have a contract with a repair company who work at weekends? Hotel was OK, rooms were pretty nice and clean, as expected. Check-in experience was not great. A welcome smile doesn't cost anything ... Location was great, just 5 minutes walk distance from down-town. Not been before, but will come again. For some reason the Novotel in Leipzig has closed, and I did wonder about the location of the Mercure Art. But it's not far from the main station, a tram stop is very conveniently placed nearby and it's the right side of town for the Zoo and one of the main parks. Also, the slightly quieter location meant I got an excellent night's sleep every night I was there. Room was excellent, modern, large bathroom, good-sized balcony. Breakfast worked well and I never had to wait for a table. I don't think they do evening meals but I wasn't after one anyway. Friendly staff and pleasant area at the front to sit, where I was offered a drink. Pity the lift packed up twice as my room was on the fifth floor, but they had someone in promptly to mend it. WiFi was free and worked well but you do have to keep logging in every time with a password and it covered only one item at a time. Overall I would certainly recommend it. The hotel is situated close to main station but not in a tourist area (but close to a supermarket KONSUM), the rooms are great unconventional with an art touch. The staff was very friendly and helped with all questions. The status advantages where given; I didn't take breakfast. 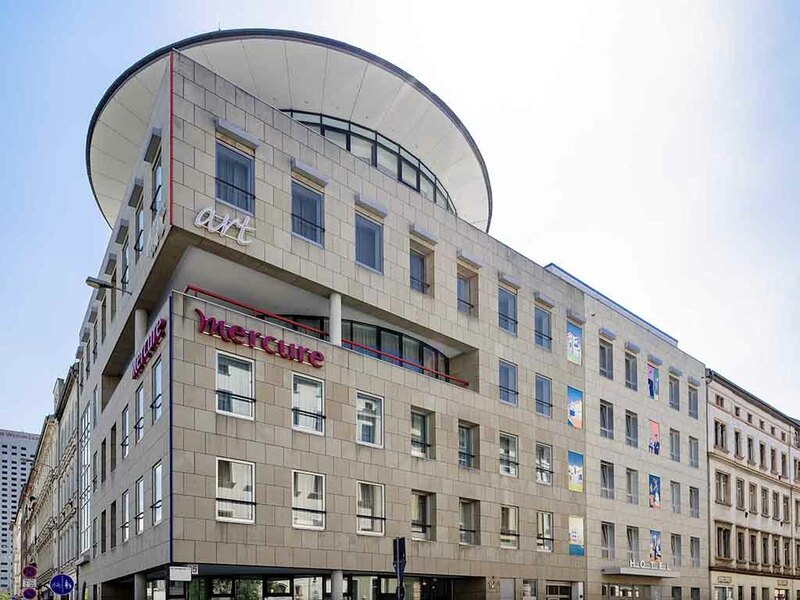 Our first stay in this Art Mercure hotel was very pleasant and comfortable. The location just minutes from the old town is convenient especially as we arrived by car and found ample street parking- free after 18:00. Breakfast buffet was very complete offering a large choice of fruit, cold cuts, cheeze and egs..... Our room was large, modern yet very comfortable. The service friendly and efficient. In short a hotel we will certainly return to! Top floor spacious room and bathroom, well designed and decorated. Comfortable stay. Waking distance to old town. Service quick and helpful. Breakfest tasty, keeping well Accor standards. Looking forward to stay therre again. Nice hotel with very friendly staff. everything was clean and comfortable with some interesting decor. The car park is secure but very tight to get in and out of. The ramp is tightly curved and quite narrow and some of the spaces have moveable parking ramps in front of them. The hotel is a short walk from the cetre and an abyndance of bars and restaurants. Leipzig is okay for a overnight stop, as its Manchester where everybody speaks German. The hotel was close to the train station and the city center. There are a limited number of sights to see but it was still a good stop over on the way to Prague. This is a good, comfortable hotel with friendly staff. It is convenient to the main station and city centre. Both can be accessed on foot within 10 minutes; however, there is also a tram stop directly facing the hotel offering frequent services. Although the location of this hotel suffers somewhat from inner city blight, the proximity to the main station and centre of Leipzig was more important to me than the view. I would be happy to return to this hotel if visiting Leipzig again. Great hotel, comfortable clean with great staff. Very comfortable bed and good size room excellent food and the service from the staff was completely faultless. The only negative thing I can say was that the noise from the trams rumbling through the night can stop the lightest sleepers but for me it was only a welcome background murmur. This is a modern Mercure hotel between the Zoo and railway station which although convenient for both of these plus the city center. However, it is in a bit of a nothing-y sort of area consisting of mainly housing, there didn't see, to be all that much choice for places to eat in the immediate vicinity. Check in was quick and efficient and the receptionist was friendly, in fact all of the staff I encountered seemed to be nice. The rooms were clean, modern, well equipped and comfortable, although not huge. The bathroom was very good. My room faced a side road and was very quiet. The bed was comfortable and I slept well. There was also a Konsum supermarket close by which was convenient. I had breakfast on my last morning and I liked the range and quality of the food on offer. The breakfast room itself was a bit small and crowded though which meant that there was a bit of congestion both around, and getting to the buffet. All said though, this is a good hotel and I enjoyed my stay and would recommend it for anyone who wishes to stay close to both the railway station, zoo and city center. We picked this hotel from a list due to its closeness to Leipzig Zoo the location for the 5th ICZoo (International Congress of Zookeepers) Conference and numerous restaurants, plus shopping centres. It was easy walking to all locations we needed to get to. Stayed there for four nights. The room was clean, but there was really no place to put down your luggage. The bar was not open any of the evenings, even though it was supposed to be open from 7.00 p.m. This was a setback, because there were no other bars in the neighbourhood. The staff was nice. The room and the bathroom were very clean. Beware of the garage: it is really very tight. The breakfast was just ok, but interesting was that the bacon was cooked in a different manner every morning. Terrible location and no air conditioning! Beautiful, smart room, thanks. I had a very comfortable stay and breakfast was superb. The hotel is modern and stylish and is a short walk from the city centre and main railway station. It was very quiet. the front desk person was nice. the room and bathroom were very clean. the location of the hotel was convenient, walking distance to city center. Parking was interesting, we ended up at the nearby zoo parking garage and 24 hour service, only 6 euro for the night. I still want to hit the zoo, we will come back and stay at Mercure. Location is very good, just between the main railway station and the excellent zoo. You can walk the distance from the station in 8 minutes or take the tram/streetcar. Room was modern, good shower no bath in our room. Wi-fi for free, no watercooker alas. Breakfast was ok and plentiful. Staff correct and polite. It's a bit off the city centre but still close enough to walk, a brisk 10 minutes walk our use the very well organized public transport. Very good location.Nice and clean hotel.Cover parking- very narrow entrance !! !Be carefull - it is not for a little bigger cars ! !Also roomwas a little to small,but we slept very well.Good breakfast !! !